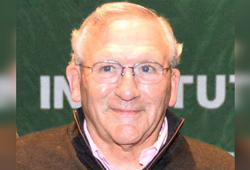 "I have been very fortunate and have had, on balance, a charmed life" So says Tim Cunningham '67, founder of Chicago-based OPTIS Partners, which has represented over 250 insurance agent-broker clients in merger and acquisition transactions, and provides a wide array of consulting services related to the insurance industry. Tim also volunteers his time, working with Union League Boys and Girls Clubs and as a member of St. Pat's Finance Committee. Tim recounts his blessings: "Great family, siblings, spouse, daughter, friends and a successful career. Perfect-no; but pretty darn good. Have I worked hard? I think so. Have I been lucky? Yes. I seem to recall that Jack Kernan, athletic director during my years at St. Pat's, would frequently say 'luck is what happens when preparation meets opportunity'. That saying is most often used in a sports context, but is more applicable to and beneficial in life." "As I reflect on [my high school years] 50 years ago, I initially struggled a bit academically, but we finally got it and figured out how to study and be reasonably successful in the classroom. And yes, I received a great education, but I believe I received much more than that. The mission of St. Pat's half a century ago was, I believe, broader than academics, as it was to provide an ethical foundation and to teach, mentor and instill in its students the skills and discipline to be prepared to capture the many opportunities presented to us in life. The mission of St. Pat's remains the same as it was when I was a student. My goal, therefor, is quite simple. I want to give back and I want to be able, to the best of my ability, be certain St. Pat's has the resources to continue its great mission."